Teenagers Lucy Carpenter and Sammy McCombe have albinism and they want you to know that it’s OK with them. 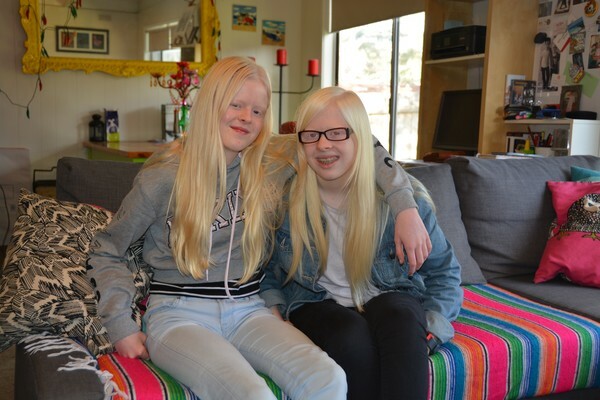 Lucy, 14, from Ocean Grove and Sammy, 13, from Geelong, started an Instagram account that deals with albinism and currently have more than 8000 followers from all around the world. Albinism in humans is a congenital disorder characterised by the complete or partial absence of pigment in the skin, hair and eyes. Albinism is associated with a number of vision defects. Lack of skin pigmentation makes for more susceptibility to sunburn and skin cancers. One in 17,000 people have albinism. The popularity of Lucy and Sammy’s Instagram account came as a surprise. “It was a way for us to raise awareness for albinism,” St Ignatius College student Lucy said. Lucy’s vision is worse than Sammy’s, but both girls just get on with their lives. As I sat down to talk to them, their maturity, bravery and confidence within themselves was refreshing to see in people so young. The girls have been bullied, but they insist it has not been relentless. “Bullying is a thing that can happen to anyone,” Lucy said. “It’s got nothing to do with our brains,” Sammy, from Sacred Heart College, said. Lucy loves the beach, but must be extra careful with sun protection. This often means she only goes between 7am and 9am on hot days or after sunset. “When I do go, it’s sunscreen every half hour, long sleeves and such,” she said. Lucy is not sure what she wants to do when she leaves school, but a career in performing arts or the media is something she is interested in. Sammy wants to dabble is music and singing. “We just want everyone to know that people with albinism can do the things that people tell us we can’t do,” Sammy said. To follow Lucy and Sammy’s journey, go to @lucy_and_sammy on Instagram.